My Grandma Penny lived on a farm on the outskirts of Clewiston Florida. Every time we visited we would fill sacks with oranges and tangerines to take home. One year we had a bucket full of oranges and my sister and I decided to make orange juice. We learned quick that it takes a lot of oranges to make one glass of orange juice. Years later my dad brought home these little tubes that stick into the top of the orange allowing you to drink from the orange. We loved them. We would squeeze our oranges to get every last drop out then split them open and eat the insides. 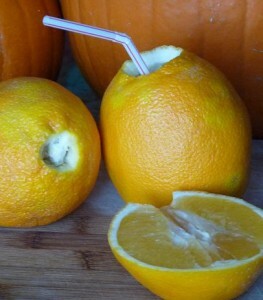 The tubes were a clever way to drink fresh orange juice straight from the source. I am surprised they did not survive the test of time. I was reminded of my dad’s sacred find when the kids mentioned they would love a glass of orange juice. We did not have any orange juice in the house but we did have 4 oranges. The kids were shocked that they could drink orange juice from an orange. I know we have made fresh squeezed orange juice before. 1. Take an orange wash it then roll it on a cutting board pressing down firmly. This will break the little capsules that hold the juice. 2. Using a knife cut a small circular opening in the top of the orange. About 1/2 to 3/4-inches in width. Slide the knife tip downward into the hole then turn a few times. 3. Drink directly from the opening or use a straw. Squeeze the orange to draw out the juice while you slurp.